A retinal ganglion cell (RGC) is a type of neuron located near the inner surface (the ganglion cell layer) of the retina of the eye. It receives visual information from photoreceptors via two intermediate neuron types: bipolar cells and retina amacrine cells. Retina amacrine cells, particularly narrow field cells, are important for creating functional subunits within the ganglion cell layer and making it so that ganglion cells can observe a small dot moving a small distance. Retinal ganglion cells collectively transmit image-forming and non-image forming visual information from the retina in the form of action potential to several regions in the thalamus, hypothalamus, and mesencephalon, or midbrain. Retinal ganglion cells vary significantly in terms of their size, connections, and responses to visual stimulation but they all share the defining property of having a long axon that extends into the brain. These axons form the optic nerve, optic chiasm, and optic tract. A small percentage of retinal ganglion cells contribute little or nothing to vision, but are themselves photosensitive; their axons form the retinohypothalamic tract and contribute to circadian rhythms and pupillary light reflex, the resizing of the pupil. The six types of retinal neurons are bipolar cells, ganglion cells, horizontal cells, retina amacrine cells, and rod and cone photoreceptors. There are about 0.7 to 1.5 million retinal ganglion cells in the human retina. With about 4.6 million cone cells and 92 million rod cells, or 96.6 million photoreceptors per retina, on average each retinal ganglion cell receives inputs from about 100 rods and cones. However, these numbers vary greatly among individuals and as a function of retinal location. In the fovea (center of the retina), a single ganglion cell will communicate with as few as five photoreceptors. In the extreme periphery (ends of the retina), a single ganglion cell will receive information from many thousands of photoreceptors. A false-color image of a flat-mounted rat retina viewed through a fluorescence microscope at 50x magnification. The optic nerve was injected with a fluorophore, causing retinal ganglion cells to fluoresce. W-ganglion- small, 40% of total, broad fields in retina, excitation from rods, detect direction movement anywhere in the field. X-ganglion- medium diameter, 55% of total, small field, color vision. Sustained response. Y- ganglion cells- largest, 5%, very broad dendritic field, respond to rapid eye movement or rapid change in light intensity. Transient response. P-type retinal ganglion cells project to the parvocellular layers of the lateral geniculate nucleus. These cells are known as midget retinal ganglion cells, based on the small sizes of their dendritic trees and cell bodies. About 80% of all retinal ganglion cells are midget cells in the parvocellular pathway. They receive inputs from relatively few rods and cones. They have slow conduction velocity, and respond to changes in color but respond only weakly to changes in contrast unless the change is great (Kandel et al., 2000). They have simple center-surround receptive fields, where the center may be either ON or OFF while the surround is the opposite. M-type retinal ganglion cells project to the magnocellular layers of the lateral geniculate nucleus. These cells are known as parasol retinal ganglion cells, based on the large sizes of their dendritic trees and cell bodies. About 10% of all retinal ganglion cells are parasol cells, and these cells are part of the magnocellular pathway. They receive inputs from relatively many rods and cones. They have fast conduction velocity, and can respond to low-contrast stimuli, but are not very sensitive to changes in color (Kandel et al., 2000). They have much larger receptive fields which are nonetheless also center-surround. BiK-type retinal ganglion cells project to the koniocellular layers of the lateral geniculate nucleus. K-type retinal ganglion cells have been identified only relatively recently. Koniocellular means "cells as small as dust"; their small size made them hard to find. About 10% of all retinal ganglion cells are bistratified cells, and these cells go through the koniocellular pathway. They receive inputs from intermediate numbers of rods and cones. They have moderate spatial resolution, moderate conduction velocity, and can respond to moderate-contrast stimuli. They may be involved in color vision. They have very large receptive fields that only have centers (no surrounds) and are always ON to the blue cone and OFF to both the red and green cone. Photosensitive ganglion cells, including but not limited to the giant retinal ganglion cells, contain their own photopigment, melanopsin, which makes them respond directly to light even in the absence of rods and cones. They project to, among other areas, the suprachiasmatic nucleus (SCN) via the retinohypothalamic tract for setting and maintaining circadian rhythms. Other retinal ganglion cells projecting to the lateral geniculate nucleus (LGN) include cells making connections with the Edinger-Westphal nucleus (EW), for control of the pupillary light reflex, and giant retinal ganglion cells. Most mature ganglion cells are able to fire action potentials at a high frequency because of their expression of Kv3 potassium channels. Below is a very quick summary. For a reference source, please consult "Connecting the Retina to the Brain" by Erskine et al. and "Retinal Axon Growth at the Optic Chiasm" by Petros TJ et al. Most information highlighted below comes from these two excellent reviews. Retinal ganglion cells (RGCs) are born between embryonic day 11 (E11) and post-natals (PN) day zero (PN0) in the mouse and between week 5 and week 18 in utero in human development. In mammals, RGCs are typically added at the beginning in the dorsal-central aspect of the optic cup, which is located in the center of the eye. Then, RC growth will sweep out ventrally and peripherally from there, in a wave-like pattern. This process depends on a host of factors, ranging from signaling factors like FGF3 and FGF8 to proper inhibition of the Notch signaling pathway. Most importantly, the bHLH (basic Helix-Loop-Helix)-domain containing transcription factor Atoh7 and its downstream effectors, such as Brn3b and Isl-1, work to promote RGC survival and differentiation. The "differentiation wave" that drives RGC development across the retina is also regulated in particular of the bHLH factors Neurog2 and Ascl1 and FGF/Shh signaling, deriving from the periphery. Early progenitor RGCs will typically extend processes connecting to the inner and outer limiting membranes of the retina with the outer layer adjacent to the retinal pigment epithelium (RPE) and inner adjacent to the future vitreous humor. The cell soma will pull towards the RPE, undergo terminal differentiation, and then migrate backwards towards the inner limiting membrane. It will then extend an axon in the retinal ganglion cell layer. This process is likely mediated by Slit-Robo signaling, which controls the retraction of the apical process of the RGC. RGCs will grow along glial end feet positioned on the inner vitreal surface (side closest to the future vitreous humor). Neural cell adhesion molecule (N-CAM) will mediate this attachment via homophilic (N-CAM binds only to that isotope of N-CAM: A with A, B with B, never A with B) interactions. Slit signaling also plays a role, preventing RGCs from growing into layers beyond the optic fiber layer. Axons form the RGCs will grow and extend towards the optic disc, where they exit the eye. Once differentiated, they are bordered by an inhibitory peripheral region and a central attractive region, thus promoting extension of the axon towards the optic disc. CSPGs exist along the retinal neuroepithelium (surface over which the RGCs lie) in a peripheral high-central low gradient. Slit is also expressed in a similar pattern, secreted from the cells in the lens. Adhesion molecules, like N-CAM and L1, will promote growth centrally and will also help to properly fasciculate (bundle) the RGC axons together. Shh is expressed in a high central, low peripheral gradient, promoting central-projecting RGC axons extension via Patched-1, the principal receptor for Shh, mediated signaling. RGCs exit the retinal ganglion cell layer through the optic disc, which requires a 45° turn. This requires complex interactions with optic disc glial cells which will express local gradients of Netrin-1, a morphogen that will interact with the Deleted in Colorectal Cancer (DCC) receptor on growth cones of the RGC axon. This morphogen initially attracts RGC axons, but then, through an internal change in the growth cone of the RGC, Netin-1 becomes repulsive, pushing the axon away from the optic disc. This is mediated through a cAMP dependent mechanism. Additionally, CSPGs and Eph/Ephrin signaling may also be involved. RGCs will grow along glial cell end feet in the optic nerve. These glia will secrete repulsive Semaphorin 5a and Slit in a surround fashion, covering the optic nerve which ensures that they remain in the optic nerve. Vax1, a transcription factor is expressed by the ventral diencephalon and glial cells in the region where the chiasm is formed, and it may also be secreted to control chiasm formation. When RGCs approach the optic chiasm, the point at which the two optic nerves meet, at the ventral diencephalon around E10-E11 in the mouse, they have to make the decision to decussate to the contralateral optic tract or remain in the ipsilateral optic tract. In the mouse, about 5% of RGCs, mostly those coming from the ventral-temporal crescent (VTc) region of the retina, will remain ipsilateral, while the remaining 95% of RGCs will cross. This is largely controlled by the degree of binocular overlap between the two fields of sight in both eyes. Mice do not have a significant overlap, whereas, humans, who do, will have about 50% of RGCs cross and 50% will remain ipsilateral. Once RGCs reach the chiasm, the glial cells supporting them will change from an intrafascicular to radial morphology. A group of diencephalic cells that express the cell surface antigen stage-specific embryonic antigen (SSEA)-1 and CD44 will form an inverted V-shape. They will establish the posterior aspect of the optic chiasm border. Additionally, Slit signaling is important here: Heparin sulfate proteoglycans (HSPGs), proteins in the ECM, will anchor the Slit morphogen at specific points in the posterior chiasm border. RGCs will begin to express Robo, the receptor for Slit, at this point thus facilitating the repulsion. RGC axons traveling to the contralateral optic tract need to cross. Shh plays a role in this. It is expressed along the midline in the ventral diencephalon, providing a repulsive cue to prevent RGCs from crossing the midline ectopically. However, a hole is generated in this gradient, thus allowing RGCs to decussate (research is still actively done to understand the mechanism behind this isolated obliteration). Molecules mediating attraction include NrCAM, which is expressed by growing RGCs and the midline glia and acts along with Sema6D, mediated via the Plexin-A1 receptor. VEGF-A is released from the midline directs RGCs to take a contralateral path, mediated by the Neuropilin-1(NRP1) receptor. cAMP seems to be very important in regulating the production of NRP1 protein, thus regulating the growth cones response to the VEGF-A gradient in the chiasm. The only component in mice projecting ipsilaterally are RGCs from the ventral-temporal crescent in the retina, and only because they express the Zic2 transcription factor. Zic2 will promote the expression of the tyrosine kinase receptor EphB1, which, through forward signaling (see review by Xu et al.) will bind to Ephrin B2 ligand expressed by midline glia and be repelled to turn away from the chiasm. Some VTc RGCs will project contralaterally because they express the transcription factor Islet-2, which is a negative regulator of Zic2 production. Shh plays a key role in keeping RGC axons ipsilateral as well. Shh is expressed by the contralaterally projecting RGCs and midline glial cells. Boc, or Brother of CDO (CAM-related/downregulated by oncogenes), a co-receptor for Shh that influences Shh signaling through Ptch1, seems to mediate this repulsion, as it is only on growth cones coming from the ipsilaterally projecting RGCs. Other factors influencing ipsilateral RGC growth include the Teneurin family, which are transmembrane adhesion proteins that use homophilic interactions to control guidance, and Nogo, which is expressed by midline radial glia. The Nogo receptor is only expressed by VTc RGCs. The role of Nogo in signaling at the chiasm, however, is still under active study. Finally, other transcription factors seem to play a significant role in altering. For example, Foxg1, also called Brain-Factor 1, and Foxd1, also called Brain Factor 2, are winged-helix transcription factors that are expressed in the nasal and temporal optic cups and the optic vesicles begin to evaginate from the neural tube. These factors are also expressed in the ventral diencephalon, with Foxd1 expressed near the chiasm, while Foxg1 is expressed more rostrally. They appear to play a role in defining the ipsilateral projection by altering expression of Zic2 and EphB1 receptor production. Once out of the optic chiasm, RGCs will extend dorsocaudally along the ventral diencephalic surface making the optic tract, which will guide them to the superior colliculus and lateral geniculate nucleus in the mammals, or the tectum in lower vertebrates. Sema3d seems to be promote growth, at least in the proximal optic tract, and cytoskeletal re-arrangements at the level of the growth cone appear to be significant. 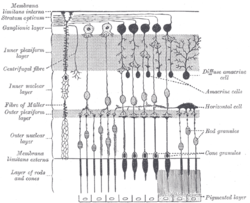 In most mammals, the axons of retinal ganglion cells are not myelinated where they pass through the retina. However, the parts of axons that are beyond the retina, are myelinated. This myelination pattern is functionally explained by the relatively high opacity of myelin—myelinated axons passing over the retina would absorb some of the light before it reaches the photoreceptor layer, reducing the quality of vision. There are human eye diseases where this does, in fact, happen. In some vertebrates, for example the chicken, the ganglion cell axons are myelinated inside the retina. ^ Masland, R. H. (2012). "The tasks of amacrine cells". Visual Neuroscience. 29 (1): 3–9. doi:10.1017/s0952523811000344. PMC 3652807. PMID 22416289. ^ Watson, A. B. (2014). "A formula for human retinal ganglion cell receptive field density as a function of visual field location" (PDF). Journal of Vision. 14 (7): 15. doi:10.1167/14.7.15. ISSN 1534-7362. PMID 24982468. ^ Curcio, Christine A.; Sloan, Kenneth R.; Kalina, Robert E.; Hendrickson, Anita E. (1990). "Human photoreceptor topography" (PDF). The Journal of Comparative Neurology. 292 (4): 497–523. doi:10.1002/cne.902920402. ISSN 0021-9967. PMID 2324310. ^ Principles of Neural Science 4th Ed. Kandel et al. ^ "Ionic conductances underlying excitability in tonically firing retinal ganglion cells of adult rat". ^ Henne, J.; Pottering, S.; Jeserich, G. (2000). "Voltage-gated potassium channels in retinal ganglion cells of trout: a combined biophysical, pharmacological, and single-cell RT-PCR approach". J. Neurosci. Res. 62 (5): 629–637. doi:10.1002/1097-4547(20001201)62:5<629::AID-JNR2>3.0.CO;2-X. PMID 11104501. ^ Henne, J.; Jeserich, G. (2004). "Maturation of spiking activity in trout retinal ganglion cells coincides with upregulation of Kv3.1- and BK-related potassium channels". J. Neurosci. Res. 75 (1): 44–54. doi:10.1002/jnr.10830. PMID 14689447. ^ a b c d e f g h i j k Erskine, Lynda; Herrera, Eloisa (2014-01-01). "Connecting the retina to the brain". ASN Neuro. 6 (6): 175909141456210. doi:10.1177/1759091414562107. ISSN 1759-0914. PMC 4720220. PMID 25504540. ^ Petros, Timothy J.; Rebsam, Alexandra; Mason, Carol A. (2008-01-01). "Retinal axon growth at the optic chiasm: to cross or not to cross". Annual Review of Neuroscience. 31: 295–315. doi:10.1146/annurev.neuro.31.060407.125609. ISSN 0147-006X. PMID 18558857. ^ Pacal, Marek; Bremner, Rod (2014-05-01). "Induction of the ganglion cell differentiation program in human retinal progenitors before cell cycle exit". Developmental Dynamics. 243 (5): 712–729. doi:10.1002/dvdy.24103. ISSN 1097-0177. PMID 24339342. ^ a b Hufnagel, Robert B.; Le, Tien T.; Riesenberg, Ashley L.; Brown, Nadean L. (2010-04-15). "Neurog2 controls the leading edge of neurogenesis in the mammalian retina". Developmental Biology. 340 (2): 490–503. doi:10.1016/j.ydbio.2010.02.002. ISSN 1095-564X. PMC 2854206. PMID 20144606. ^ a b Thompson, Hannah; Andrews, William; Parnavelas, John G.; Erskine, Lynda (2009-11-15). "Robo2 is required for Slit-mediated intraretinal axon guidance". Developmental Biology. 335 (2): 418–426. doi:10.1016/j.ydbio.2009.09.034. ISSN 1095-564X. PMC 2814049. PMID 19782674. ^ a b Sánchez-Camacho, Cristina; Bovolenta, Paola (2008-11-01). "Autonomous and non-autonomous Shh signalling mediate the in vivo growth and guidance of mouse retinal ganglion cell axons". Development. 135 (21): 3531–3541. doi:10.1242/dev.023663. ISSN 0950-1991. PMID 18832395. ^ Höpker, V. H.; Shewan, D.; Tessier-Lavigne, M.; Poo, M.; Holt, C. (1999-09-02). "Growth-cone attraction to netrin-1 is converted to repulsion by laminin-1". Nature. 401 (6748): 69–73. doi:10.1038/43441. ISSN 0028-0836. PMID 10485706. ^ Kim, N.; Min, K. W.; Kang, K. H.; Lee, E. J.; Kim, H. T.; Moon, K.; Choi, J.; Le, D.; Lee, S. H.; Kim, J. W. (2014-09-08). "Regulation of retinal axon growth by secreted Vax1 homeodomain protein". eLife. 3: e02671. doi:10.7554/eLife.02671. PMC 4178304. PMID 25201875. Retrieved 2016-03-07. ^ Sretavan, D. W.; Feng, L.; Puré, E.; Reichardt, L. F. (1994-05-01). "Embryonic neurons of the developing optic chiasm express L1 and CD44, cell surface molecules with opposing effects on retinal axon growth". Neuron. 12 (5): 957–975. doi:10.1016/0896-6273(94)90307-7. ISSN 0896-6273. PMC 2711898. PMID 7514428. ^ Wright, Kevin M.; Lyon, Krissy; Leung, Haiwen; Leahy, Daniel J.; Ma, Le; Ginty, David D. (2012-12-06). "Dystroglycan organizes axon guidance cue localization and axonal pathfinding". Neuron. 76 (5): 931–944. doi:10.1016/j.neuron.2012.10.009. ISSN 0896-6273. PMC 3526105. PMID 23217742. ^ Erskine, Lynda; Reijntjes, Susan; Pratt, Thomas; Denti, Laura; Schwarz, Quenten; Vieira, Joaquim M.; Alakakone, Bennett; Shewan, Derryck; Ruhrberg, Christiana (2011-06-09). "VEGF Signaling through Neuropilin 1 Guides Commissural Axon Crossing at the Optic Chiasm". Neuron. 70 (5): 951–965. doi:10.1016/j.neuron.2011.02.052. ISSN 0896-6273. PMC 3114076. PMID 21658587. ^ Dell, Alison L.; Fried-Cassorla, Emma; Xu, Hong; Raper, Jonathan A. (2013-07-03). "cAMP-induced expression of neuropilin1 promotes retinal axon crossing in the zebrafish optic chiasm". The Journal of Neuroscience. 33 (27): 11076–11088. doi:10.1523/JNEUROSCI.0197-13.2013. ISSN 1529-2401. PMC 3719991. PMID 23825413. ^ Xu, Nan-Jie; Henkemeyer, Mark (2012-02-01). "Ephrin reverse signaling in axon guidance and synaptogenesis". Seminars in Cell & Developmental Biology. 23 (1): 58–64. doi:10.1016/j.semcdb.2011.10.024. ISSN 1096-3634. PMC 3288821. PMID 22044884. ^ Pak, Winnie; Hindges, Robert; Lim, Yoo-Shick; Pfaff, Samuel L.; O'Leary, Dennis D. M. (2004-11-12). "Magnitude of binocular vision controlled by islet-2 repression of a genetic program that specifies laterality of retinal axon pathfinding". Cell. 119 (4): 567–578. doi:10.1016/j.cell.2004.10.026. ISSN 0092-8674. PMID 15537545. ^ Allen, Benjamin L.; Song, Jane Y.; Izzi, Luisa; Althaus, Irene W.; Kang, Jong-Sun; Charron, Frédéric; Krauss, Robert S.; McMahon, Andrew P. (2011-06-14). "Overlapping Roles and Collective Requirement for the Coreceptors GAS1, CDO, and BOC in SHH Pathway Function". Developmental Cell. 20 (6): 775–787. doi:10.1016/j.devcel.2011.04.018. ISSN 1534-5807. PMC 3121104. PMID 21664576. ^ Wang, Jun; Chan, Chung-Kit; Taylor, Jeremy S. H.; Chan, Sun-On (2008-06-01). "Localization of Nogo and its receptor in the optic pathway of mouse embryos". Journal of Neuroscience Research. 86 (8): 1721–1733. doi:10.1002/jnr.21626. ISSN 1097-4547. PMID 18214994. ^ Kenzelmann, Daniela; Chiquet-Ehrismann, Ruth; Leachman, Nathaniel T.; Tucker, Richard P. (2008-01-01). "Teneurin-1 is expressed in interconnected regions of the developing brain and is processed in vivo". BMC Developmental Biology. 8: 30. doi:10.1186/1471-213X-8-30. ISSN 1471-213X. PMC 2289808. PMID 18366734. ^ Herrera, Eloísa; Marcus, Riva; Li, Suzanne; Williams, Scott E.; Erskine, Lynda; Lai, Eseng; Mason, Carol (2004-11-15). "Foxd1 is required for proper formation of the optic chiasm". Development. 131 (22): 5727–5739. doi:10.1242/dev.01431. ISSN 0950-1991. PMID 15509772. ^ Sakai, Jill A.; Halloran, Mary C. (2006-03-01). "Semaphorin 3d guides laterality of retinal ganglion cell projections in zebrafish". Development. 133 (6): 1035–1044. doi:10.1242/dev.02272. ISSN 0950-1991. PMID 16467361. ^ Villegas, G.M. (1960). "Electron microscopic study of the vertebrate retina". J. Gen. Physiol. 43 (6): 15–43. doi:10.1085/jgp.43.6.15. PMC 2195075. PMID 13842313.